The Festival of Science is an exciting, newly-designed festival for school technicians offering enjoyable and entertaining STEM knowledge for all who attend. 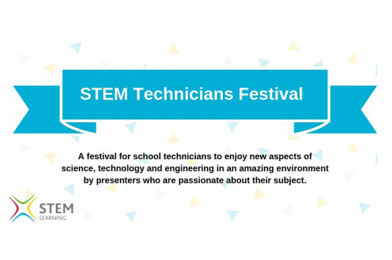 A festival for all school technicians to enjoy new aspects of science, technology and engineering in an amazing environment by presenters who are passionate about their subject. Over the day you will experience hands on workshops and listen and engage with presenters who are all experts in their field. Also in attendance will be some fantastic scientific suppliers, who are always great to discuss and share ideas with. One of the headliners is Dr Andrea Mapplebeck, who will be creating scientific fun with 40 experiments based on a well-known cola drink. In this session technicians will be able to learn about simple but effective experiments which encourage students to look at everyday objects in a scientific way. Presenting at the festival will be Angie Ridout, Chief Science Technician and STEM Club Coordinator, who will run a session on STEM Club activities which will help any technician who wants to create or support a STEM club in their school. The festival will have biology and chemistry sessions with workshops on bananas & micro propagation in industry. Joanne Buckley, who has worked with the BBC, local radio and The Times, will demonstrate some weird and wonderful facts about edible chemistry. A variety of speakers from the University of York will be speaking about their work and how it will affect STEM subjects in the future. Engineering workshops will be another focus of the festival, where technicians can learn about 3D printing and take part in an aerodynamics workshop with Dr Nicolas M Bojdo from Manchester University. consider science subjects and experience technology and engineering workshops or talks. Location: National STEM Learning Centre, University of York, York.